One of Malawi’s leading daily newspapers has had to endure a barrage of social media trolling due to its gaffe on Tuesday’s, 25 September 2018 paper under the International sports section. In an article title “Tiger Woods is back” a picture of the professional golfer was captioned “Liverpool’s Xherdan Shaqiri(L) and Sadio Mane celebrate one of the goals”. 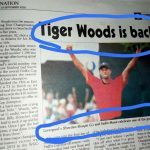 The article which had nothing to do with Liverpool F.C or football was about Tiger Wood’s latest professional win, his 80th PGA Tour title, marking his comeback as a major contender again. Woods won by two shots to win while world number 1, Justin Rose finished tied fourth.